Real time data encryption and creation of VPN tunnels using IPsec, OpevVPN PPTP and L2TP. Additional management software available like SmartWorx HUB and R-SeeNet. The SmartFlexTM SR308 cellular router provides secure Internet connectivity for devices and LANs via the cellular networks. It can be used to provide automatic wireless failover for wired networks, wireless connectivity for devices in remote locations where cable connections are impractical, and wireless connectivity for mobile assets. Advantech's cellular routers were placed on each ferry and hard-connected to PoE cameras and broadcast systems. The cellular routers collect data for forwarding over-the-air via a 3G/4G carrier service to both the control center and the kiosks at each wharf. The cellular routers also had GPS functionality, which enabled real-time localization. 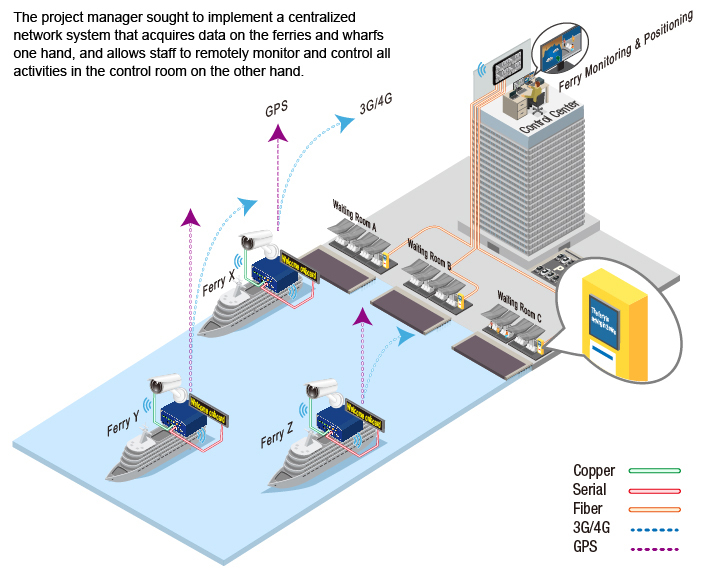 The control center, which is responsible for monitoring multiple ferries, receives onboard and positional information from the cellular routers on each ferry, converts the raw data into meaningful passenger information, and sends it to each wharf via a fiber connection. Passenger information kiosks were installed at each wharf to display real-time ferry location and boarding information via a dashboard. Follow us on Twitter and LinkedIn for more updates and videos about Advantech.. If you would like to unsubscribe, Click Here to email us.